Make sure you run pub get or pub upgrade in your target project directory. Here's an example of pubviz run on itself. If you have configured your PATH correctly, you can run pubviz directly. Generate and open an html file for the package on the current path. 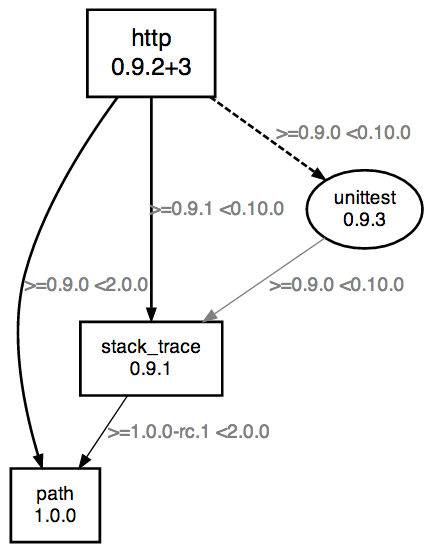 Print GraphViz dot format to command line for a package on a specified path. open   Populate a temporary file with the content and open it. print  Print the output to stdout. [html] (default)    Wrap the GraphViz dot format in an HTML template which renders it. -i, --ignore-packages         A comma seperated list of packages to exclude in the output. -o, --[no-]flag-outdated      Check pub.dartlang.org for lasted packages and flag those that are outdated. -?, --help                    Print this help content. If <package path> is omitted, the current directory is used.